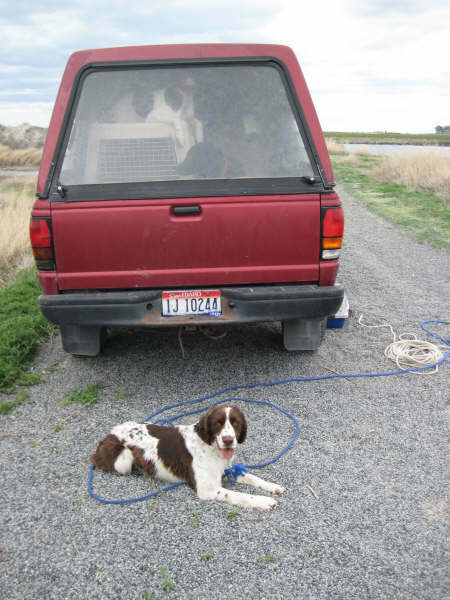 I just wanted to write and tell everyone how thrilled John and I have been with the liver and white springer that we got from Whispering Winds Kennels in 2004. We waited a little later to get "Crash" trained for pheasant hunting (he turned 3 years old last October) but it is in his blood to get on those birds. He greatest assest during the training was his willingness to please. 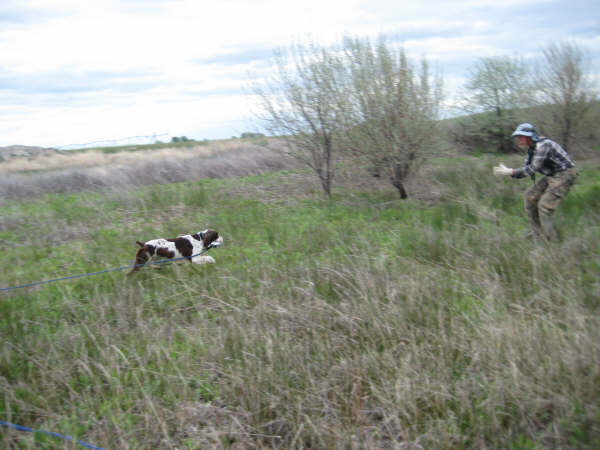 He is the kind of springer that learns fast, listens to commands well and can literally hunt all day. 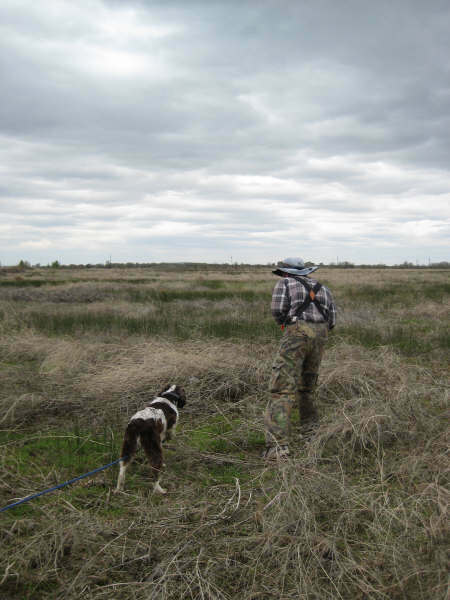 On top of that, he can scent a bird at 25 yards, run great patterns into the wind and is a strong swimmer for those water retrievals. What else can you ask for in a hunting dog!? The Colonel is one great friend. He learns fast and loves young kids, rides in the pickup and riding the four wheeler. one terrific companion. One of my neighbors calls him my side-kick. Here are a few pictures that I thought you might enjoy. He is 10 weeks old on the one where he is retrieving and 16 weeks in the other photos. This Saturday was Bree’s first pheasant hunt at a game farm near Clearwater and I can tell you that she definitely lives up to being a “flushing spaniel”. After flushing several pheasant in cooperation with my brother in law’s pointer she was able to flush one completely on her own, nearly getting a mouthful of tail feathers. Her legs aren’t yet long enough to really bust through the cover, but I’m very proud of her performance! A few hours later out on the logging trails we were able to flush nine ruffed grouse which is the most I’ve ever seen on such a short walk. It was amazing to watch her break through the brush, stop on a dime, wheel around and flush a bird. She’s really shaping up to be the perfect hunting companion, and to tell you the truth it has much more to do with her bloodlines than it does my training – general obedience and a few hours a week tossing a scented dummy this summer is all she’s been through. She’s also a wonderful family pet. As you might remember, my wife runs a daycare out of our home – all of the kids love her, and she has a great time playing with them in the back yard. We get constant complements when we take her on walks or to the park and more than a few people have offered to take her home right then and there. She’s been a great addition to our family and I just wanted to let you know how much we appreciate her. 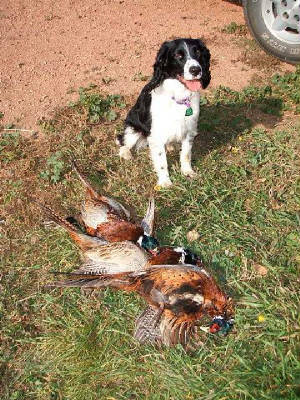 I’ve attached a picture of Bree from her first pheasant hunt. been a great addition to our family. I spoke with you earlier this year to see if Crash's litter mates turned out to be good hunting dogs and it was great news to hear that two of his litter mates have done well too. wind and is a strong swimmer for those water retrievals. What else can you ask for in a hunting dog!? Roberts, Idaho. Please feel free to post this on your testimonials page. Your springers are something to talk about! I just wanted to give you guys a quick update on the tri-colored springer that we purchased from you last fall from Roxie and Stewart's litter. Her name is Annabelle and she is quite the sweetheart! She is incredibly fun-loving and truly lives each day to the fullest (full of energy of course!). She is incredibly smart and picks up on commands and new tricks very fast. She has been retrieving since the first week we've had her. She is a great addition to our family and we could not imagine life without her. She has been very healthy and has been growing like a weed since we picked her up. You guys do a great job of raising dogs and we get stopped so many times when we are out walking with people complimenting her on how beautiful she is. 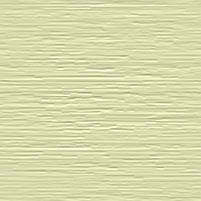 I am attaching a few pictures so that you can se what she looks like. Thank you guys again and we definitely will not even think twice about where to look when we decide to get another dog. was amazed at her talent as a hunting dog this year. She hunted a few times last year and did pretty good. as to why, but I want to keep this brief. me the opportunity to raise this pup. I cannot put into words how much this dog means to me. Aren't I an adorable one!!! We have had the Grace for about a month now...and girl, is she growing! 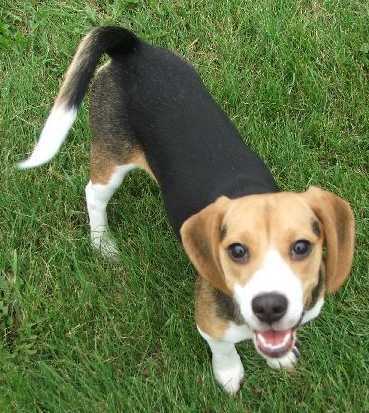 She is full of personality and is one energetic puppy. Gracie is fully housetrained (she has become a bell ringer...just in time for the holidays) and is one smart girl. She will do anything for a treat. She can sit, stay, lay down, scoot, shake-a-paw, speak, be quiet, jump, come, etc. on command. The kids love her puppy kisses. She loves to play fetch, and is working on giving the ball. Her favorite game is hide and seek. She can track any of us down in no time at all. When the weather was nice, she loved galloping around outside (nose down of course). She is not a fan of the cold or snow (just eating it). Gracie is working on OFF and NO NIPPING, but we understand that she is a curious puppy and everything is up high and tastes good. Kennel training her was a breeze. She whimpered a bit the first week, but only at night because she had to go pee. She sleeps through the night now...Yeah! Thank you for taking such good care of our puppy those first 8wks.keeping us posted with all your updates and pictures too. Can't thank you enough for giving our Ella girl such a good start. It was nice meeting you and Kim and all the other Beagles including Ella's mommy Fury and daddy Beemer. Ella is a wonderful addition to our family. Very sweet and so cuddly. She's miss smarty pants too. I kid you not she would sit on command by 9 wks. We love her very much in fact most would say we spoil her. I guess there is a reason why we call her princess a times. Can't thank you enough for giving her such a good start in life! I wondering if I could get cards for me to hand out at school. I would love to hand out cards for you. 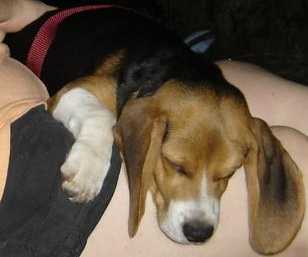 My friends love beagles and I told some of them that you gave us the puppies. Thank you. ( This letter was written from another very *special* girl. Even though we have not had the priveledge to meet her yet, we will soon get the chance). We were looking at the website for the millionth time and noticed that the testimonials are way too biased towards the Springers. So we are sending you this message to forward to everyone that BEAGLES RULE! Since Mike and I have been married, we've had a variety of breeds which have all been loved and unique, but we can't remember being this entertained by our dogs ever. Not a day goes by that we don't get the giggles from the antics of Hunter and Annabelle. They are very intelligent and the best part is snuggling up with them at the end of the day. We can't wait to make the trip to pick up Copper and look forward to seeing you and Kim again. Thank you, Kelly, Mike, Meghann, Mollie, Mikey and Emma. Kim and I would like to take the time to thank everyone who chose us to get their family companion. And a *Special* Thanks to those who have had the faith and confidence in us to get more than 1 puppy. What can I say?? I'm Cute!!! I am sitting here holding Jasper, just sobbing!! I am so filled with joy, this is the best day I have had in a long time. As my husband approached home from Bemidji, my heart was racing and my stomach got so sick. I didn't even realize how much my whole body missed Toby and how very much I was excited for Jasper to join our family. Kim and Kevin, he is so perfect!!!!!!!!!!! What a gem!!! He is fitting in with our family, so wonderful. It wasn't meant for Toby to go, but God led you to give us this special pup. If you hadn't graced our home with this gift, we could not have done this at this time. I love him so much already. No words can ever thank you enough, so you'll be stuck with a forever friend. The kids got the surprise of their life!! Thank you Thank you Thank you Thank you!!! My family is whole and complete once again. My great kids and a Springer! WONDERFUL!! 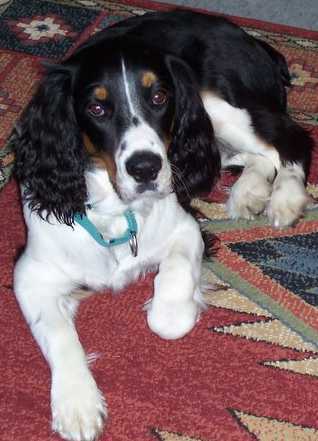 I have always wanted a blk/wht/tri Springer & just recently purchased "Onyx" our lil gem from Kevin & Kim. I have never had a puppy flown in before but everything went great!! Was a little worried about how she would handle the flight, but she arrived just as happy & perky as if we had drove up & picked her up ourselves. Flying did not effect her at all, to me this shows that this paticular line of breeding has a lot of confidence, she was not afraid of us at all, didn't hide in her crate or show any signs of being nervous. She was just happy to see us & took right to us. This also shows that she does come from a great breeder, they obviously spend time with their puppies because "Onyx" is very outgoing & not timid at all. I cannot say enough about the awesome qualities that "Onyx" has & she is only 9 weeks old! Kevin & kim kept in great contact with me through out everything & I loved watching her grow with the updated pics on their site since I had to wait until she was old enough to fly. I gave "Onyx" her name before she arrived at her new home with us, Kevin & Kim must have obviously worked with her some learning her name because the day we got her she was already responding to her name. 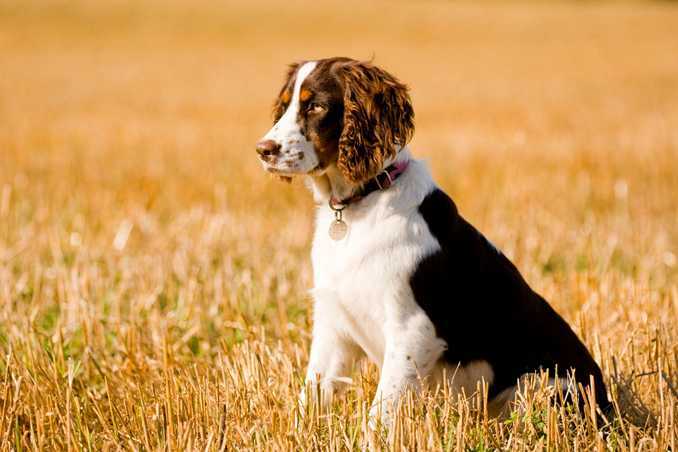 I may in the future want to add a lvr/wht/tri to our family & I will definately check with them first & anyone that is looking to purchase a Springer I highly recommend Whispering Wind Kennels. Buy with confidence!!! Buttercup or Precious or Boo Boo Licious. we've given her, how loved she is! her birds and never gives up! have found Kevin and Kim! Dealing with Kevin and Kim is so awesome! dedicated to pups and to their clients! with another "kid" from Kevin and Kim! After college I moved to Minneapolis to start my career. Living in an apartment complex I was not able to have a puppy. As my career began to take off I managed to move to my home town. As such, I began looking for a puppy. 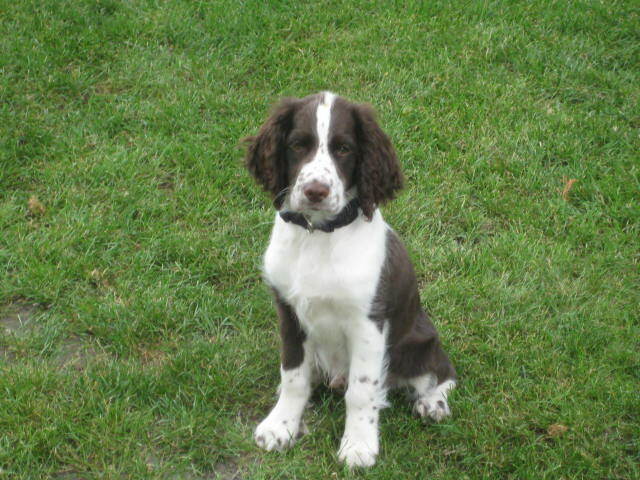 Growing up as a child I had a Springer Spaniel and I know them to be a wonderful, loving dog. They have a mild disposition, and are very family oriented. Furthermore, I know them to be great hunting dogs. 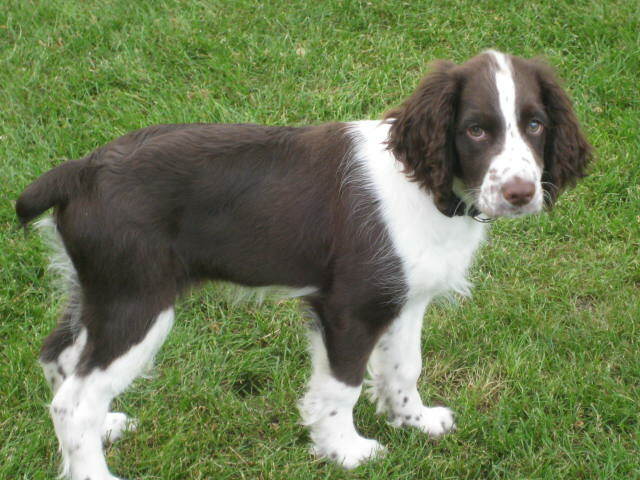 I did some research in order to locate breeders that bred Springers. I came across Whispering Winds Kennel operated by Kevin and Kim Sellin. 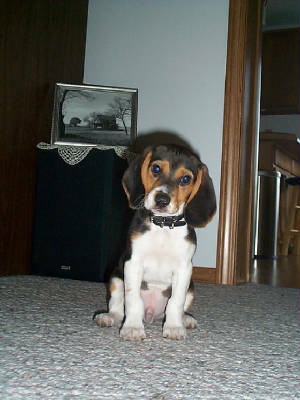 We began to communicate via e-mail and I became convinced that this is the place from which I would get my new puppy. Kevin and Kim did an excellent job of keeping my updated on the condition of the dogs they used to breed the litter, Sadie and Stewart. Once the puppies were born I received several updates, including pictures, on how the puppies were doing. I had the chance to visit the puppies once before I brought my little one home. I was very happy with the conditions and care the puppies were getting. I was also impressed with Sadie and Stewart. Both are gentle, loving dogs. On July 8th I was able to bring my new puppy, Molly. Molly has been a wonderful addition my life. My husband wanted a Springer Spaniel for hunting. After endless searching in Arizona, We found Kim and Kevin on line. 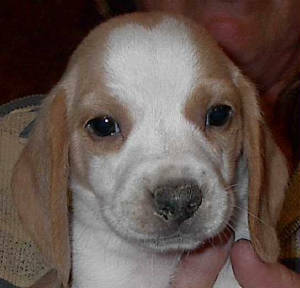 They E-mailed us photos of liver and white female puppies and all of them were exactly what we were looking for. To my suprise Kim and Kevin had flown puppies all over the United States and flying a puppy all the way to Arizona was not an unusual task for these kennel owners. 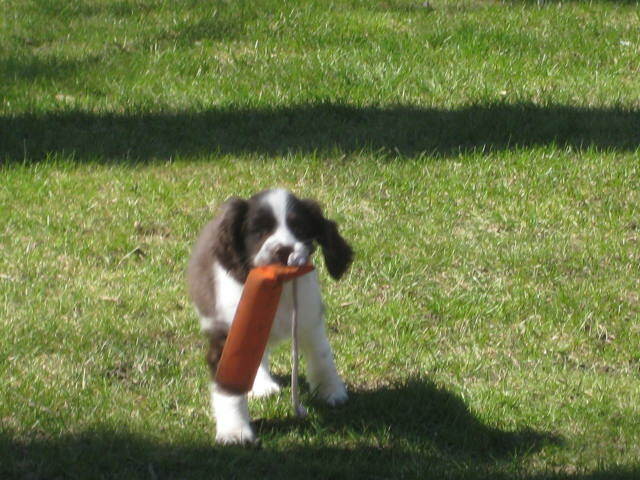 Our Puppy "Randi" flew from Bemidji Minnesota to Phoenix Arizona and arrived as the "Perfect Puppy." Her traveling kennel was made cofortable by a hand made quilt that was embroidered with her name. I personally recommend the "Whispering Winds Kennel" to anyone who ever had doubts about purchasing a pet and flying them across the United States. Kim and Kevin are professionals who really care about their puppies. Randi is a happy hunter her instinct is incredible, she really is just the dog we wanted. Our puppy, Casey has just been a delight! She did well on the car trip, slept most of the time and thanks to your directions we had a very fast trip. As you can see she is growing like a weed. She goes to the vet tomorrow. She seems to have settled into our routine and is very peppy and happy. I'll forward more pictures to you as she grows. enjoy him and he is a woderful edition to our family. 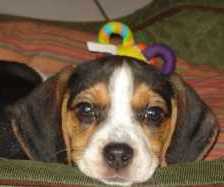 our other beagle Sarah, they are great companions. Rick & Tammy's LIL go getter !! Well my Springer female is named Hannah. She is 4 months & 2 wks old. She is really well behaved dog. Quiet, alittle shy, and learns quick. I had her out twice in the bush out here looking around. She did find the last two grouse on her own. Really flushed them out, like a pro. She is really doing great. Friendly too. Well Kevin she really is a good dog. glad I have her. She really is going to be a Great hunter. I see it in her. Hear from me again during hunting season. Going out in the bush again tomorrow. Hope everything is Great with you guys their. Thanks again for a fine Springer.